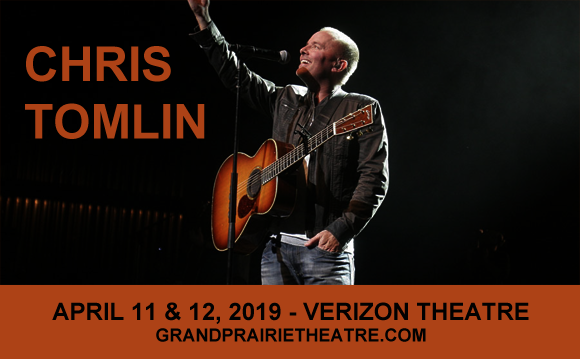 One of the most prominent worship leaders of modern times, Chris Tomlin, comes to Verizon Theatre at Grand Prairie on Thursday 11th April 2019 on his Holy Roar Tour! The Grammy Award-winning songwriter, who has penned a host of worship anthems including "How Great Is Our God", "Good Good Father", "Our God", and "Whom Shall I Fear (God of Angel Armies)", will be leading the congregation through songs from his latest album, Holy Roar, and will be joined by special guests Tauren Wells, Pat Barrett, Nicole Serrano and Pastor Darren Whitehead! Hailing from Grand Saline, Texas, Chris Tomlin had a passion for worship from a young age, writing his first worship song at just fourteen years old. Today, Tomlin has won 23 GMA Dove Awards and a Grammy Award for Best Contemporary Christian Music Album, and has sold over 7 million records, with two platinum-selling albums. Regarded by TIME magazine as potentially being the "most often sung artist anywhere". Tomlin's songs are hugely popular in churches across the globe. Thought of by many to be the first to bring contemporary worship music to the mainstream with songs like "Our God," "How Great Is Our God,""Amazing Grace (My Chains Are Gone)," "We Fall Down," "Indescribable," "Forever," "Kindness" and "Be Glorified", Tomlin made his debut in 1995 with his self-released album Inside Your Love. Since then, he has released ten major-label studio albums, including Burning Lights (2013), which is the fourth CCM album in history to reach number one on the Billboard 200 chart. His most recent release is 2018's Holy Roar.